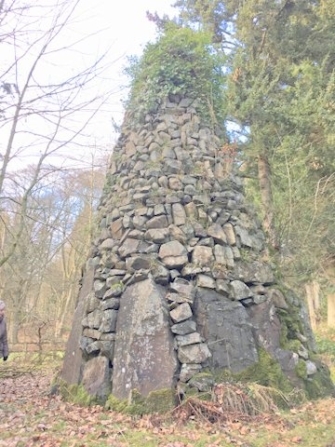 The tall cairn is located within the grounds of Philiphaugh estate. It was erected by Sir John Murray. It is located near to the old tennis courts, and permission for access should be obtained locally. 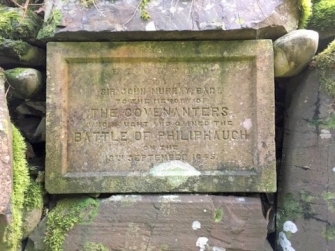 The battle of Philiphaugh took place to the west of Selkirk on 13 September 1645. The Royalists (numbering around 2,000 men) were under the leadership of Montrose, the Covenanters (about 4,100) under Sir David Leslie. The Covenanter attacked from the higher ground, the Royalists being camped in the enclosures around Philiphaugh. Some of the Covenanters made an approach on Selkirk to attack any Royalists there, before returning to the main battlefield. The Covenanters were successful in battle, which lead to the restoration of the power of the Committee of Estates. Sir David Leslie marched many Royalist prisoners to Newark castle, where he executed many, at the behest of many of the Covenanter ministers.